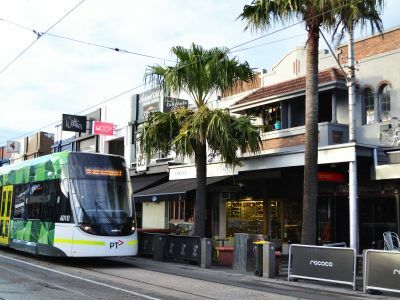 Works to revitalise the Acland Street streetscape and upgrade the tram terminus have been delivered through a partnership between Public Transport Victoria (PTV), the City of Port Phillip and Yarra Trams. The integrated place-based urban design has created space for all to enjoy local art, culture, performances and pop-up events, while improving the safety, comfort, capacity, reliability and accessibility of Route 96, one of Melbourne’s busiest tram routes. The tram terminus was redeveloped as part of the Route 96 Upgrade project and provided Council with the opportunity to revitalise the streetscape of Acland Street, which had not been refreshed since the 1990s. 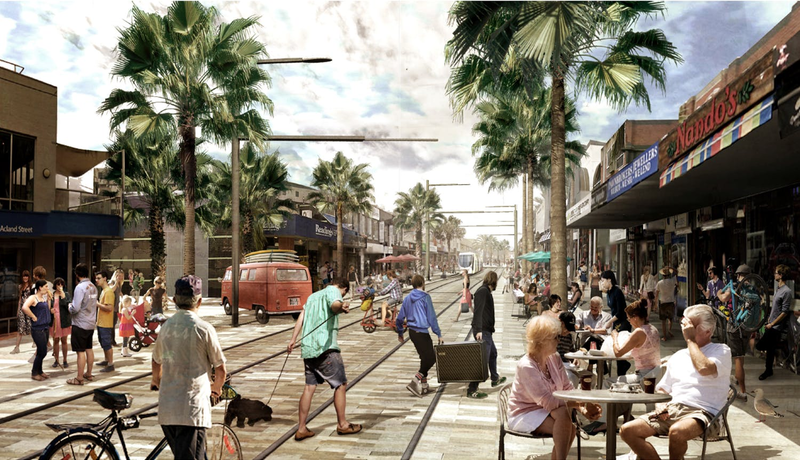 The design for Acland Street seamlessly integrates a pedestrian friendly streetscape with a new level-access Route 96 tram terminus and aligns with the principles of the Acland Street Streetscape Framework Plan and community feedback from the 2015 consultation process. 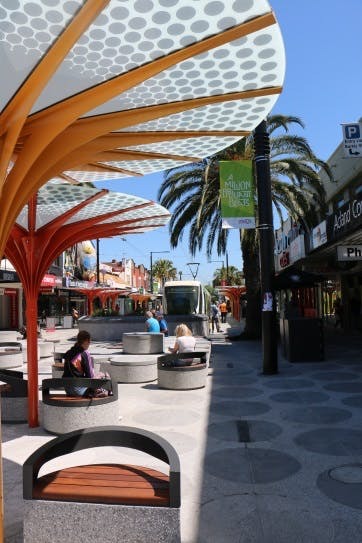 Its unique tram shelters and circle paving pattern will ensure the street remains a distinctive place, and reflects what people said was important about St Kilda. Construction of the Acland Street Upgrade took approximately three months and could not have been delivered without your patience and understanding. 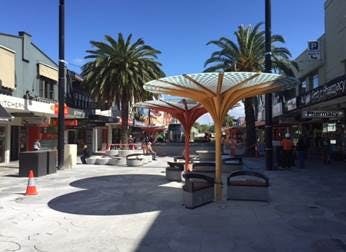 We encourage you to come down and enjoy the revitalised Acland Street and new public plaza. We will no longer be sending weekly emails, but will remain available to answer questions via phone or email. Finishing touches to the site including final paving cut-ins, painting pillar boxes, cleaning and signage installation. The Acland Street Spring Fling will be on 12 November. 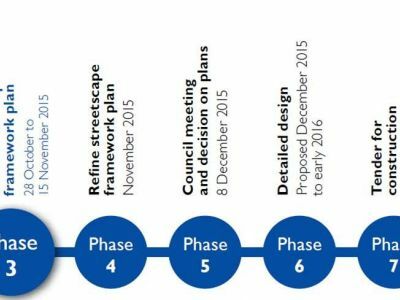 What is the Acland Street Upgrade project? 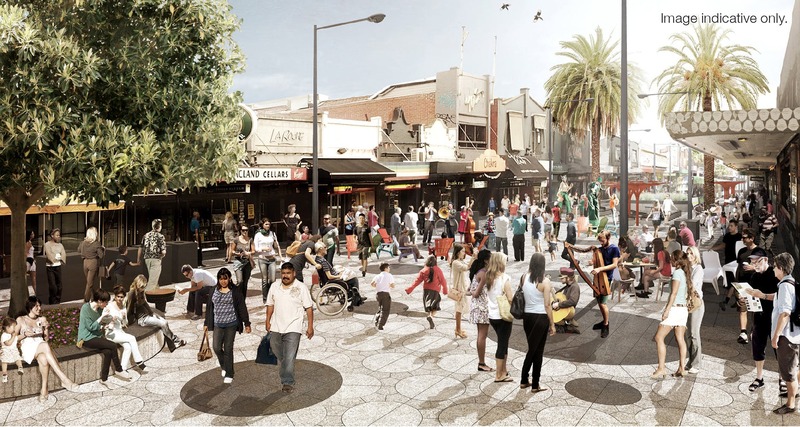 What does the Acland Street streetscape design include? Why is Route 96 being upgraded? 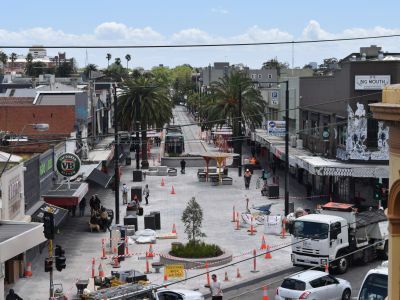 The City of Port Phillip, Public Transport Victoria (PTV) and Yarra Trams worked in partnership to revitalise the streetscape and upgrade the tram terminus on Acland Street in St Kilda. The Acland Street tram terminus was redeveloped as part of the Route 96 Upgrade Project which will improve the safety, comfort, capacity, reliability and accessibility of one of Melbourne’s busiest tram routes. 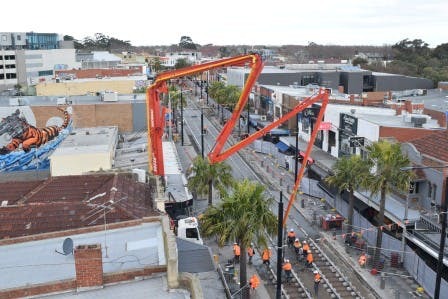 The upgrade included construction of a new level-access dual track tram terminus on Acland Street located between Belford Street and the entrance to the Acland Court Shopping Centre. Council supported PTV’s plans for the new level-access Acland Street tram terminus, because it improves access to public transport and provided an opportunity to revitalise the streetscape, which had not been refreshed since the 1990s. The final design for Acland Street seamlessly integrates a pedestrian friendly streetscape with a new level-access Route 96 tram terminus and aligns with the principles of the Acland Street Streetscape Framework Plan and community feedback from the 2015 consultation process. 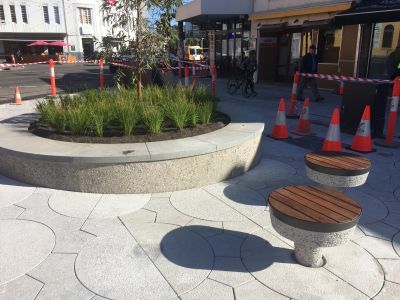 Its unique tram shelters and circle paving pattern will ensure the street remains a distinctive place, and reflects what people said was important about St Kilda. It provides It provides an urban open space for all to enjoy local art, culture, performances and pop-up events. 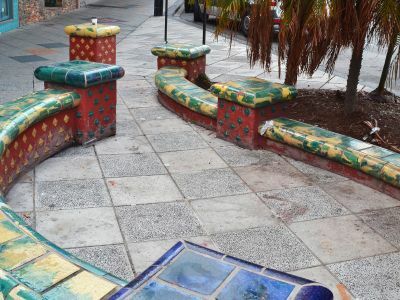 The project provided Council with an opportunity to revitalise the streetscape of Acland Street, which had not been refreshed since the 1990s. The design for Acland Street seamlessly integrates a pedestrian friendly streetscape with a new level-access tram terminus. 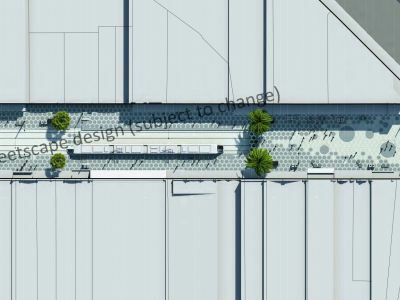 Wider, open footpaths mean people have more room to wander down Acland Street, and a new public plaza will be a year round space for activities and events. To ensure that people can walk straight from the footpath onto the platform and into a tram, the tram tracks are gradually depressed into the street in the vicinity of the two-platform terminus. All other track locations are level with the street. The footpaths widen at the terminus to form the tram platforms, allowing level access for tram passengers. 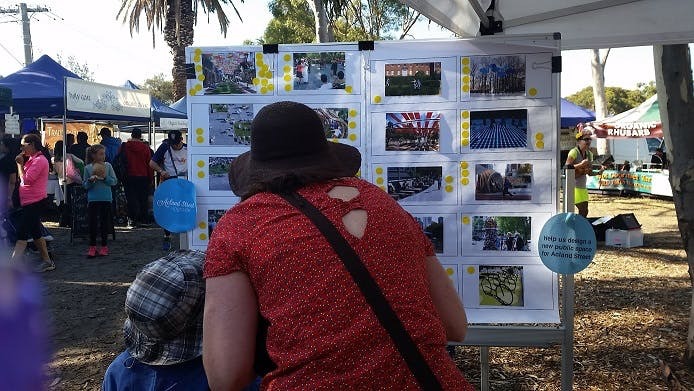 The design aligns with the principles of the Acland Street Streetscape Framework Plan and community feedback from the 2015 consultation process. Its unique tram shelters and circle paving pattern will ensure the street remains a distinctive place, and reflects what people said was important about St Kilda. The project has delivered a refreshed streetscape which provides an urban open space for all to enjoy local art, culture, performances and pop-up events. 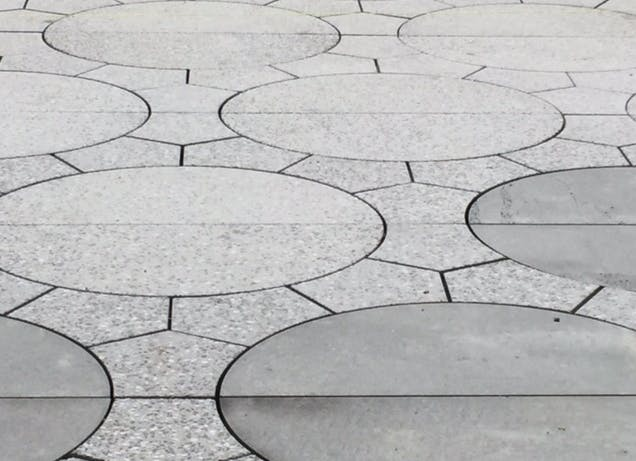 The circle paving pattern changes between the footpath and the plaza, identifying the plaza as a place for expression and play. 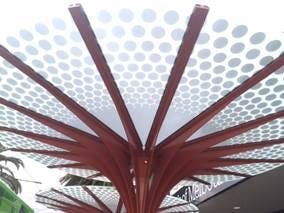 Year round weather protection is provided on the tram platforms and in the public space by new ‘umbrellas’. All existing palm trees are retained and a feature tree forms a focal point at the Barkly Street end of the plaza. The Victorian Government is committed to creating a public transport system accessible for all Victorians. As part of a $1.1 billion investment in the tram network, Route 96 is being upgraded to be Melbourne's first fully accessible route. Route 96 is one of Melbourne’s busiest tram routes, operating along a 14-kilometre corridor from Blyth Street in East Brunswick in the north, through the CBD to Acland Street, St Kilda, in the south. The whole-of-route upgrade, when paired with new E-Class trams, will improve the safety, comfort, capacity, reliability and accessibility of Route 96. 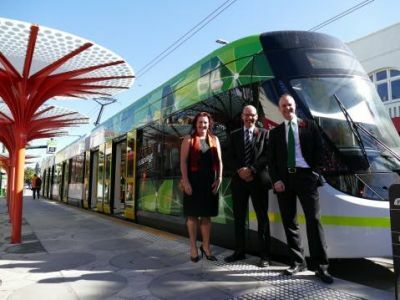 PTV is working in partnership with Yarra Trams, VicRoads, and local councils to deliver the Route 96 project. More information about the Route 96 project is available on the PTV website or by calling PTV on 1800 800 007 (6am to midnight daily). Why did the Acland Street terminus need to be upgraded? Acland Street is one of the busiest destinations on Route 96, with more than 30,000 people accessing the stop each week. A new terminus is required to provide better accessibility, and to make services on Route 96 more reliable and punctual. Trams were experiencing wait times of up to six minutes to enter the single-track terminus on Acland Street, when the terminus was already in use by another tram. The introduction of a second track alleviates these delays. The upgrade of the terminus stop to level-access improves accessibility, by enabling easy boarding and alighting from the low-floor trams that service Route 96. How long and wide are the new E-Class low-floor trams? E-class trams are currently operating on Route 96. The new E-Class trams measure approximately 33.45 metres long (less than 2 metres longer than C2 Citadis Bumble Bee trams which also operate on the route), 2.65 metres wide (the same width as C2 Citadis Bumble Bee trams) and 3.65 metres high. The E-class trams have a capacity of 210 passengers, providing capacity for an additional 10,500 passengers during peak times. What consultation was undertaken by Council? 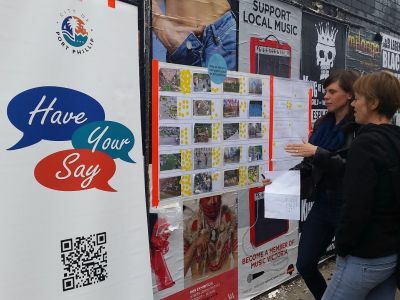 As part of the Route 96 Project Early Design community engagement process PTV distributed information and sought feedback on two concept design options for Acland Street (and Fitzroy Street) In June 2013. Concept 1 proposed to largely close Acland Street to cars with three terminus options and Concept 2 proposed one-way traffic along the east side of Acland Street with one terminus option. Formal submissions were also received from a number of stakeholders including the Council and St Kilda Traders Association. 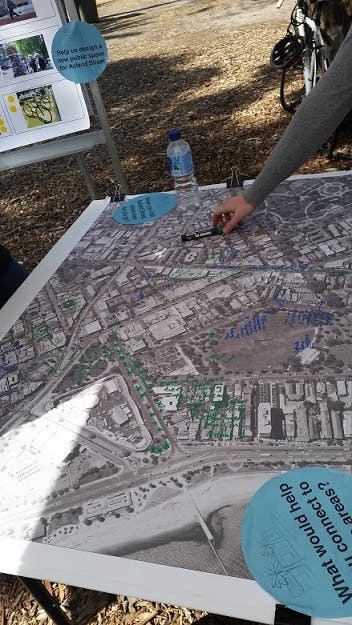 During their consultation 54 per cent of respondents (408) said that they preferred Concept 1 with Terminus A option – that included closing Acland Street to vehicles at Barkly Street and providing a centre island platform for the terminus. Further details about this PTV’s engagement process can be found in Route 96 Project Early Design Community Feedback Summary, PTV, 2013. At the November 2013 meeting Council endorsed a concept design that included an island platform tram terminus and allowed for a new public space between Acland Court and Barkly Street, resulting in changes to traffic movements and car parking throughout the Acland Street precinct. 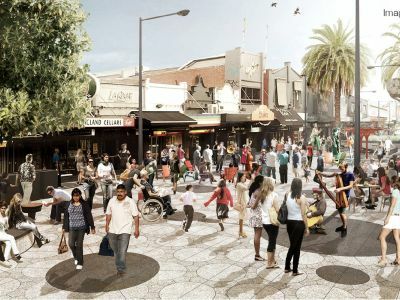 In March and April 2015 Council undertook engagement to inform the streetscape design and prepare the Streetscape Framework Plan – that has informed the design for Acland Street. 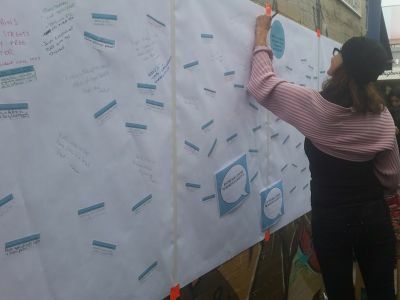 During the consultation Council engaged the community to hear their ideas, thoughts and suggestions to shape the development of Acland Street and options for upgrading the streetscape. 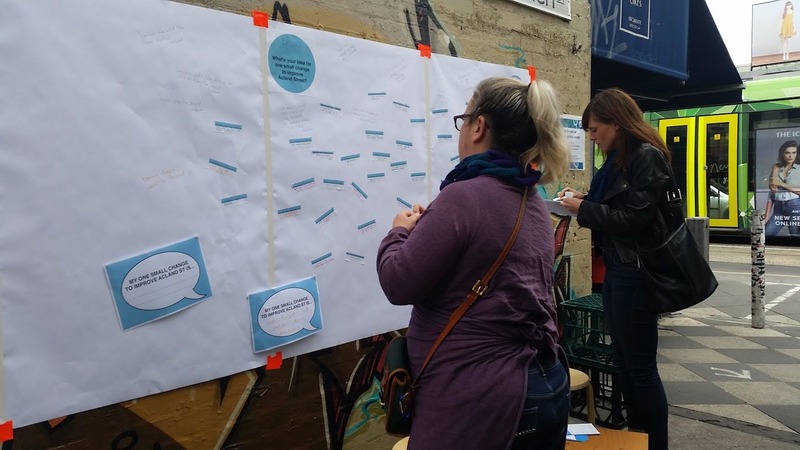 Approximately 640 pieces of feedback were received and the majority of participants shared a mutual, community-focused aspiration to ensure Acland Street remains an ongoing, vibrant area in St Kilda. The detailed findings from the engagement can be found in the Phase One Community Engagement Summary Report. 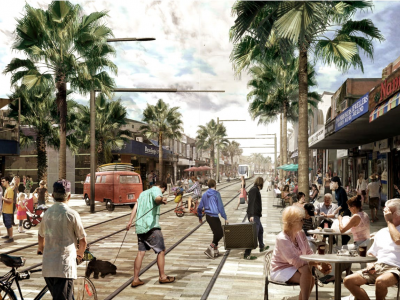 Informed by the first phase of engagement, Council developed a draft Streetscape Framework Plan that included an integrated tram terminus and streetscape for Acland Street proposed to replace the island platform tram terminus design. 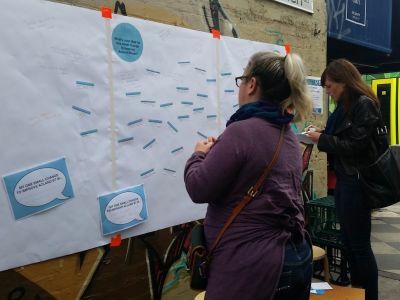 In October and November 2015 Council undertook a second phase of engagement to seek feedback on a draft Streetscape Framework Plan for Acland Street. 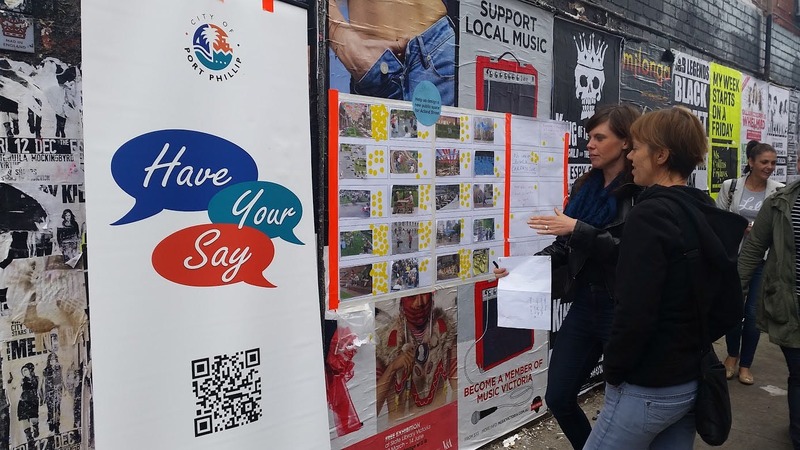 Approximately 920 pieces of feedback were received through on-street consultation sessions, via surveys, the Have Your Say page and through written and verbal submissions. Through this process it was decided that the terminus would be an integrated, two-platform tram terminus that has the tram tracks gradually descend along Acland Street as the tracks enter the terminus as this would allow the extension of footpaths to be level with the tram platforms to provide a seamless footpath and level access for tram passengers and would creating additional 640m2 of public space. The detailed findings from the engagement can be found in the Phase Two Community Engagement Summary Report. 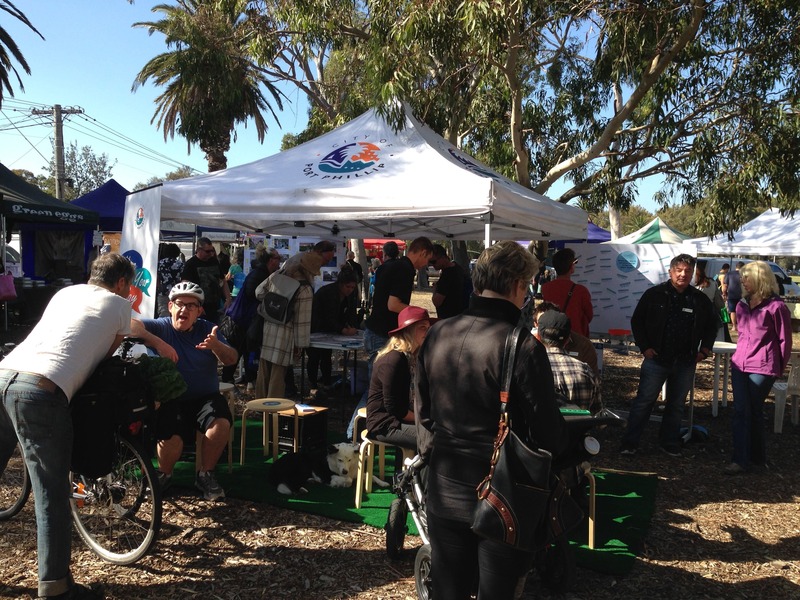 Throughout 2016, Council, in conjunction with PTV and Yarra Trams, has undertaken extensive community engagement, including fortnightly drop-in sessions, trader visits, one-to-one meetings, weekly email updates and regular letterbox distributions. Why doesn’t PTV extend Route 96 to Elwood? PTV reviewed the potential for an extension of Route 96 to Elwood but has no plans to extend the route for at least the next 15 years. The priority for PTV is upgrading accessibility of existing line infrastructure before considering extension of existing lines. 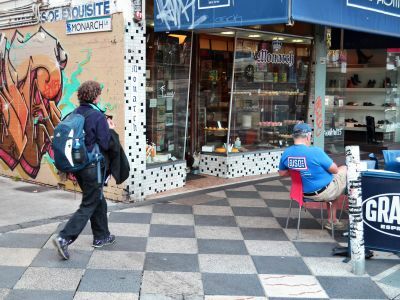 Will there be changes to footpath trading on Acland Street? Footpath trading regulations on Acland Street, as outlined in Council’s Footpath Trading Guidelines, requires a minimum unobstructed 2-metre-wide pedestrian corridor adjacent to the building line however this has been increased this to 2.5 metres on Acland Street to facilitate improved pedestrian movement. 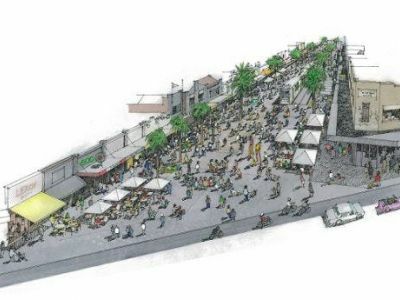 The design for the Acland Street level-access tram terminus provides for 3.8 metres of combined footpath and trading space resulting in at least 1.2 metres of remaining space for furniture and trading between the tram platform and the pedestrian corridor on both sides of Acland Street. 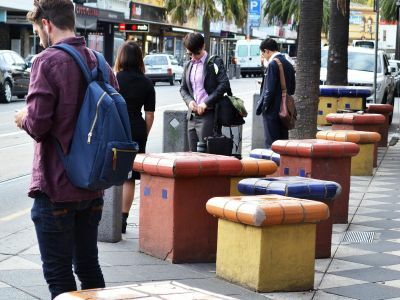 The endorsed design, released in May 2016 has provided opportunity for the majority of traders with footpath trading zones to apply for an increased space. What is the size of the new public plaza and what will it be used for? The new public plaza between Acland Court and Barkly Street is 640m2, this is equivalent to two and a half tennis courts. 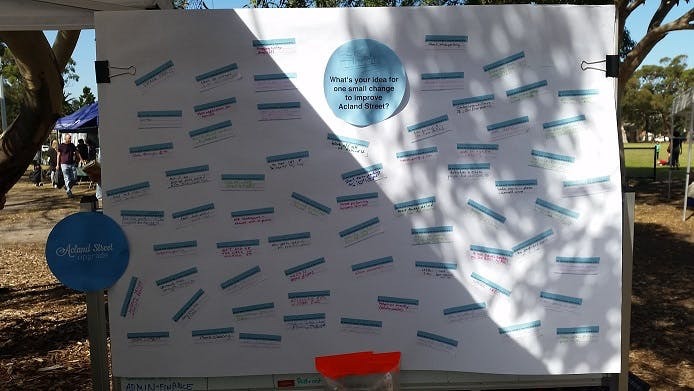 Over 70 per cent of community members who responded to our surveys in March and April 2015 told us they would like to see more entertainment and programmed activities on Acland Street. 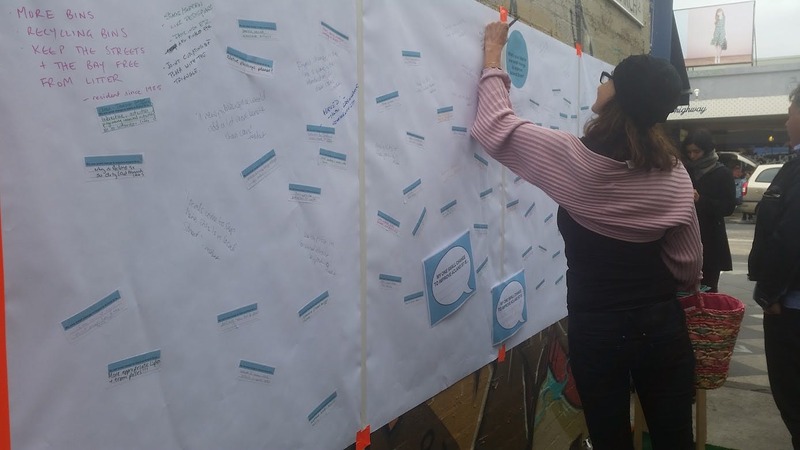 The community have strongly expressed the desire for the public space to be a place made available to the whole community. The plaza will be a year round space for activities and events and will provide accessible and easy transition for people of all abilities to access from Barkly Street to the Route 96 terminus. We are also planning how the rest of Acland Street will be integrated with this new space. How was the streetscape design informed? 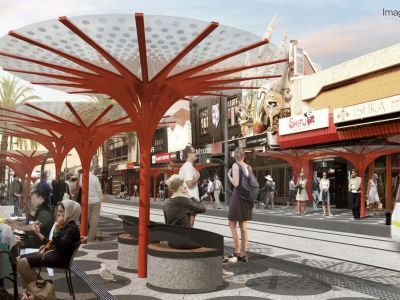 The design was informed by the vision principles outlined in the Acland Street Streetscape Framework Plan, adopted by Council in December 2015 after extensive consultation. 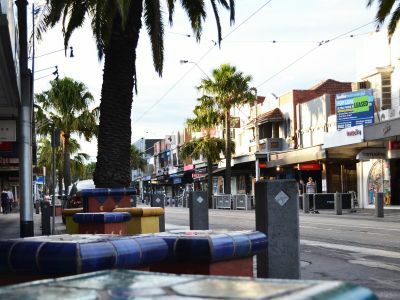 In feedback to Council, the community said streetscape changes to Acland Street should retain a St Kilda vibe and reflect the unique nature of the area. In line with that, a circular paving pattern was chosen. 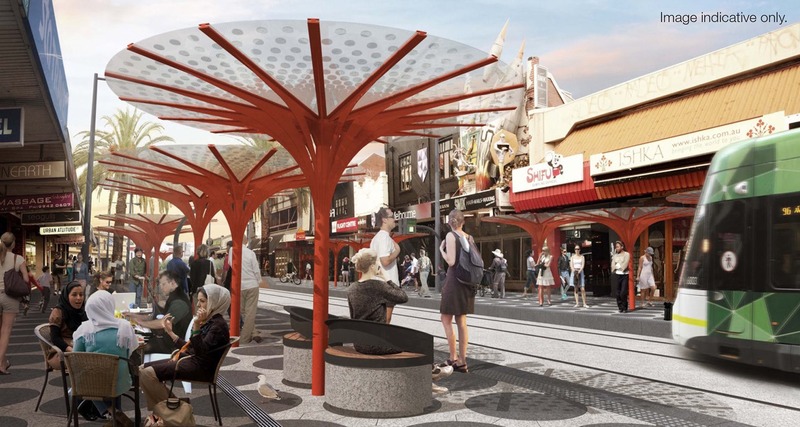 The design’s unique tram shelters and circle paving pattern will ensure the street remains a distinctive place, and reflects what people said was important about St Kilda. It provides an urban open space for all to enjoy local art, culture, performances and pop-up events. 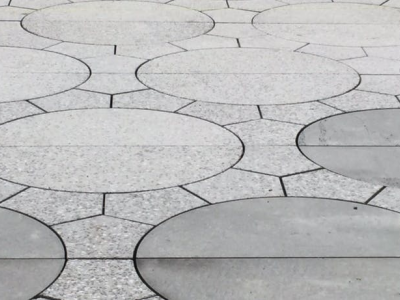 The circle paving pattern changes between the footpath and the plaza, identifying the plaza as a place for expression and play. Year round weather protection is provided on the tram platforms and in the public space by new ‘umbrellas’. A feature tree forms a focal point at the Barkly Street end of the plaza. All existing palm trees were retained. What is the feature tree? The feature tree is a 3.5 metre Angophora Costata, commonly name smooth-barked apple, or Rose gum. The Rose gum is a fast growing tree, able to reach up to 25 metres in height, and lives up to 150 years. This is a native Australian coastal tree with ornamental characteristics. The Rose gum changes with the seasons. Notably, it has white, sweet smelling flowers in summer. In spring the bark sheds and young leaves with red tips grow. The bark changes colour through the year from pink to white. Do the lowered tram tracks in the middle of Acland Street cause safety issues for pedestrians? Safety was a primary consideration throughout the detailed design process and the final design meets the exceptionally high safety standards set out by Yarra Trams and PTV. The design has been tested through a rigorous Safety in Design process including an Independent Road Safety Audit, accessibility review, and Transport Safety Victoria approval. The step change of 290mm where the tracks are lowered is made clearly visible including tactile paving for the vision impaired. A similar arrangement has been safely and effectively operating for a number of years in the Bourke Street Mall. What is the outcome of Amendment C124? On 14 January 2016 the Minister for Planning approved an amendment to the Port Phillip Planning Scheme (Amendment C124). This amendment was made at the request of the Minister for Public Transport. 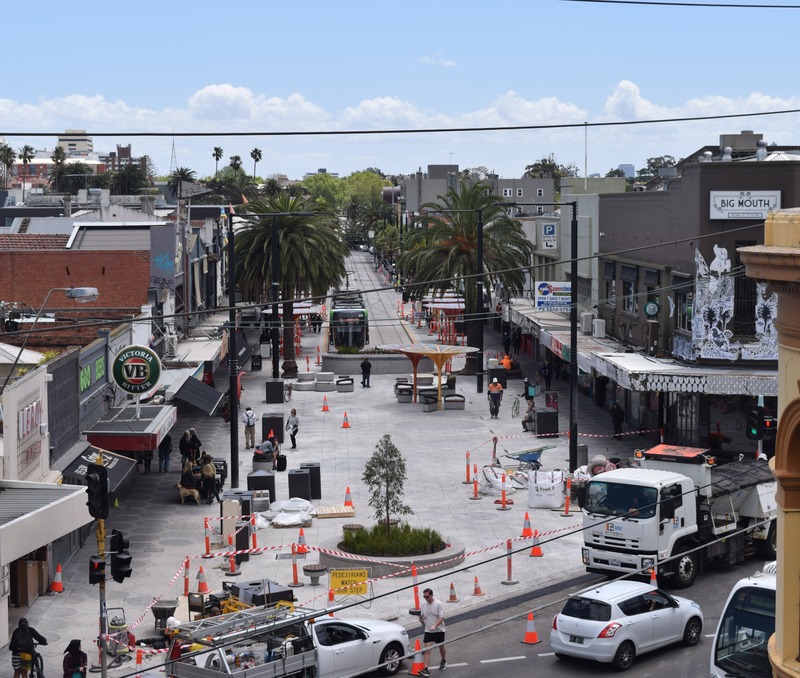 The amendment facilitates the Acland Street Upgrade Project to plan, design and deliver integrated public realm and tramway improvements in Acland Street, St Kilda. The amendment inserts a new incorporated document titled Acland Street Upgrade Project Incorporated Document, December 2015 into the schedules to Clause 52.03 and Clause 81.01 of the Port Phillip Planning Scheme. This allows the facilitation of the Acland Street Upgrade Project without a planning permit, subject to conditions in the incorporated document. Will existing height limits in the Acland Street precinct change as a result of the upgrade? There has been no change in zoning or height controls in Acland Street. The zoning and height controls continue to be prescribed by Schedule 6 to the Design and Development Overlay (DDO6) in the Port Phillip Planning Scheme. This overlay stipulates building height limits for the St Kilda area including Fitzroy Street, The Esplanade and Acland Street and was formally incorporated into the Port Phillip Planning Scheme in 2006 following a Planning Scheme Amendment. DDO6 prescribes a mandatory height limit of 10.5 metres (approximately three storeys) for all buildings facing onto Acland Street between Shakespeare Grove and Barkly Street. Buildings at the corner of Chaucer Street and Shakespeare Grove have height limits of 13.5 metres. DDO6 also seeks to “retain the urban village atmosphere (of Acland Street) by a variable scale of buildings that allow for pedestrian friendly design and active frontages”. It is noted that the DDO specifies building height limits, rather than the number of stories. As a rule of thumb, one storey equates to approximately three metres in height. Further details can be found in the map showing the current Design and Development Overlay (DDO) for the Acland Street Precinct or in Schedule 6 to the Design and Development Overlay. 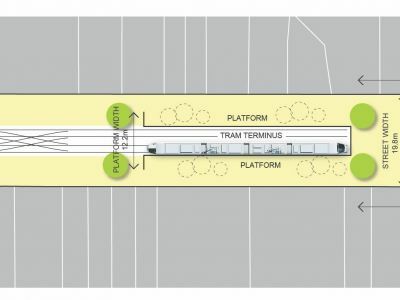 Will the new level-access tram terminus on Acland Street be classified as a transport hub in state planning legislation, allowing planners to waive height restrictions? The Acland Street Upgrade project doesn’t involve or require a review of height controls. The current height controls for Acland Street were approved in December 2005 after a major review. Any future changes to height controls would undergo public exhibition as part of the statutory process for proposing changes to planning scheme controls. When was Acland Street closed to cars? At a meeting on 22 March 2016 Council approved the permanent closure of Acland Street to vehicle traffic between Belford Street and Barkly Street. The permanent closure of Acland Street, between Belford Street and Barkly Street, took effect from 1am on 8 August 2016. Can emergency services still access the street? In the event of an emergency, ambulances, police cars and other emergency services vehicles are able to access Acland Street. Emergency services vehicles are permitted to drive along tram tracks and footpaths in the case of an emergency. The project team have met with emergency services including Ambulance Victoria, Victoria Police and Metropolitan Fire Brigade. All organisations advise that Acland Street is operationally acceptable and will have no unreasonable impact to emergency services. Can cyclists still access Acland Street? Cyclists can access Acland Street, between Shakespeare Grove and Belford Street sharing the road with trams and cars. Cyclists will be unable to ride past or through the tram terminus or plaza on Acland Street and will be required to dismount as this will be a pedestrianised area. Alternative bicycle routes are available for cyclists via the surrounding streets and additional bike parking has been installed near the intersections of Barkly Street and Belford Street. Council has an adopted Road User Hierarchy, which prioritises the needs of pedestrians above those of all other road users. 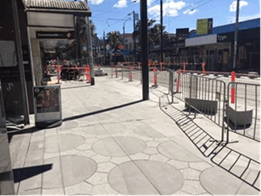 The Acland Street Upgrade provides increased space for pedestrians by including wider footpaths, a large plaza area and accessible tram stops. You can find out more about Council’s Road User Hierarchy by reading the Sustainable Transport Strategy available here. 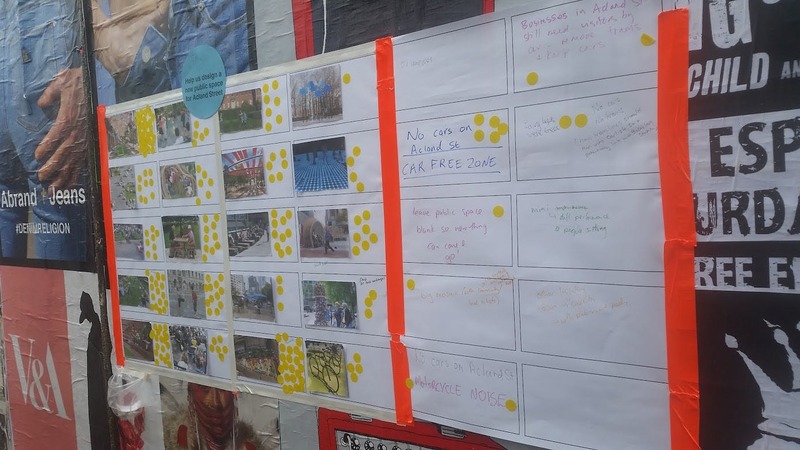 What has been done to minimise the impacts of closing Acland Street to traffic? A Traffic and Redistribution Report was commissioned by PTV in 2013 and concluded that the forecast redistribution of traffic resulting from the Acland Street Upgrade project would not exceed capacity volumes in the surrounding road network within the Acland precinct. This report was independently reviewed in May 2015 to validate the traffic analysis results contained in the 2013 report. Copies of the reports can be found in the document section of the project website. Council continues to work with PTV and VicRoads to ensure that traffic management changes best meet the needs of the surrounding road network. It can often take a number of months before traffic conditions can be reliably assessed following changed traffic conditions, as drivers may change their route or time of travel to fit in with the changed conditions. Council will conduct traffic precinct studies in March and October 2017 to assess the changes to traffic volumes in the Acland Street precinct. 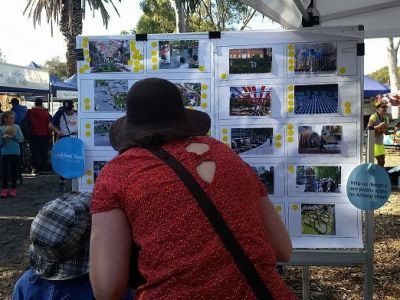 These studies will indicate whether any additional traffic management measures are required and Council will work with VicRoads to deliver improvements for traffic, bike riders and pedestrians in this precinct. The outcomes of these studies will be reported to Council in November 2017. Changes to the traffic signal timings have been made by VicRoads at the intersections of Barkly Street with Carlisle Street and Mitford Street to cater for the change in traffic movements. The traffic signals at Acland Street were removed and a pedestrian crossing installed, which leads to less time stopped at traffic lights for drivers on Barkly Street. Did Council commit to a 12 month trial of keeping Shakespeare Grove open to two way access? 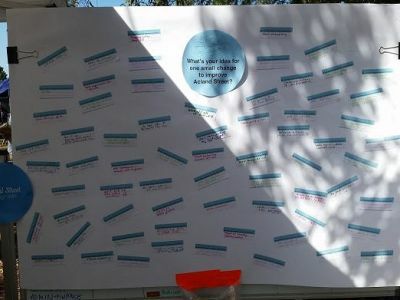 During the consultation on the Acland Street Draft Streetscape Framework Plan, concerns were raised by the community regarding the impact for vehicle access if Shakespeare Grove was converted to one-way traffic movement between Acland Street and Chaucer Street. At the 8 December Council Meeting, Council resolved to conduct a 12-month trial to maintain two-way access on Shakespeare Grove. The success this trial will be determined on factors such as safety and delay to traffic and trams. Council is currently working with PTV and Yarra Trams to refine the parameters of this trial. We will keep the community informed as we draft up the KPI’s (key performance indicators) for this trial. How have the changes to parking been managed? The closure of Acland Street included the removal of 51 on-street parking spaces and the provision of new footpath and open space on Acland Street. Acland Street is supported by a number of on-street parking spaces with varying parking restrictions within walking distance of the shopping strip. Within a 5-minute walk (400m) of the shopping strip there are over 1,900 on-street parking spaces and a further 550 parking spaces within Council owned off-street car parks. To further support Acland Street Council suspended the fees in the car spaces in Shakespeare Grove car park for the duration of the construction program. Following construction, and the community celebration at the Acland Street Spring Fling, this car park returned to paid parking, with the same restriction as before construction. Additional disabled parking spaces have also been installed in the car park. 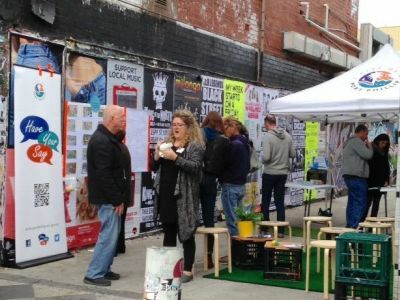 Separate to the Acland Street Upgrade the City of Port Phillip undertook a review of on-street parking restrictions for the whole of St Kilda on a precinct based approach known as the Parking Neighbourhood Scheme. As part of this, between 14 June and 15 July 2016 Council undertook consultation with residents and business on proposed parking changes. Council has now reviewed all feedback received. In streets where changes to parking restrictions are proposed, a further letter has been sent to affected properties. For more information please refer to the project website. When did Shakespeare Grove car park revert to paid parking? Parking fees in the Shakespeare Grove car park were temporarily suspended as part of Council’s commitment to supporting local businesses through construction. This car park reverted back to paid parking following the Acland Street Spring Fling. The original time restrictions (including the mix of two hour and all day spaces) are being enforced. Where are the loading zones for the Acland Street precinct? No loading zones have been removed as a result of the project. Loading zones have been extended on Barkly Street and Belford Street.The loading zones for the precinct are available in the Precinct Maps section on the project website. These zones have been informed by safety considerations, potential traffic impacts, opportunities to extend the existing loading zone spaces, and the distance between each loading zone. Did Council have to approve closing Acland Street to create the pedestrianised area? Amendment C124 to the Port Phillip Planning Scheme did not enact the closure of Acland Street. Council was required to follow all statutory obligations under the Local Government Act 1989. Schedule 11, Part 9 (1) concerns the power of Councils to place obstructions on a road permanently. In order to formally close a section of Acland Street, at the Council Meeting on 8 December 2015, Council resolved to undertake a statutory process under Schedule 11 of the Local Government Act for a Permanent Road Closure to Acland Street between Belford Street and Barkly Street. This resolution did not include plans to conduct a trial road closure. This process commenced on 2 February 2016. To inform the community and traders, a letter and email were distributed, and an advertisement was placed in the Port Phillip Leader. The project team also visited Acland Street traders to talk with them about the road closure. Interested parties were able to make a written submission by 2 March 2016. Council received 47 submissions. Submitters and members of the public are also invited to make a verbal submission at the Council Meeting on 22 March. 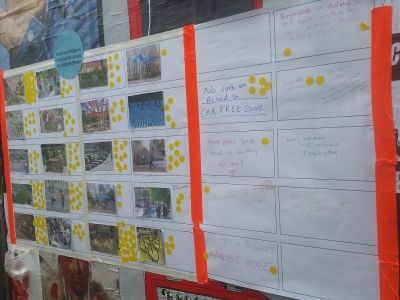 How was the permanent closure of Acland Street approved? Council is required to follow all statutory obligations under the Local Government Act 1989. Schedule 11, Part 9 (1) concerns the power of Councils to place obstructions on a road permanently. At a meeting on 8 December 2015, Council resolved to undertake a statutory process under Schedule 11 of the Local Government Act for a Permanent Road Closure to Acland Street between Belford Street and Barkly Street. This resolution did not include plans to conduct a trial road closure. Interested parties were able to make a written submission by 2 March 2016. Council received 47 submissions. Submitters and members of the public were also invited to make a verbal submission at the Council Meeting on 22 March 2016. All Councillors were in attendance, and the motion to approve the permanent closure of Acland Street was carried unanimously. The agenda, reports and minutes of the 22 March meeting is available on Council’s website. Did Council investigate any alternatives to the permanent road closure? During the initial assessment in 2013, Council, PTV and Yarra Trams considered a range of alternative options including maintaining one-way access on Acland Street between Belford Street and Barkly Street and utilising the tram stop at Luna Park. Why didn’t Council conduct a trial closure? Council was not required to conduct a traffic diversion experiment under the road closure process. It is noted that following a change in traffic conditions, it can often take a number of months before traffic conditions can be reliably assessed, as drivers may change their route or time of travel to fit in with the changed conditions. What happened during the construction period? Construction of the Acland Street Upgrade took approximately three months, from August to October 2016. The terminus construction and replacement of tram tracks between Belford Street and Carlisle Street were completed over a nine-day period between Monday 8 August to Wednesday 17 August 2016. 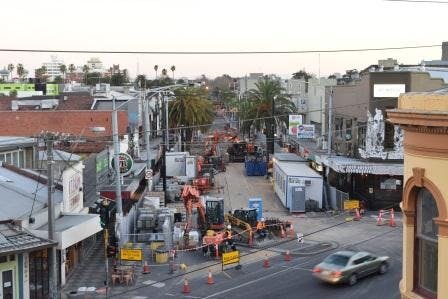 The Acland Street Streetscape works started on the 17 August. 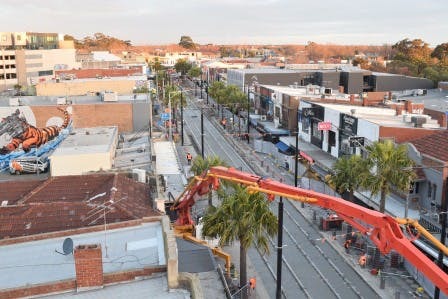 The streetscape construction program was varied throughout the course of works to respond to access requirements, acceleration opportunities and to incorporate works by essential service providers to minimise future disruption to businesses and residents. The paving was completed in stages within each zone to minimise impacts to traders and maintain pedestrian access. Details including approximate timing and noise levels were made available through our regular Works Updates, and weekly email updates were issued to confirm works for the following week, including night works. 350 construction crew members worked for over 22,100 hours on site. Approximately 5,000 bluestone pavers were quarried from the Mount Rouse lava flow near Port Fairy. Each half-metre diameter semicircle bluestone paver weighs up to 75kg. 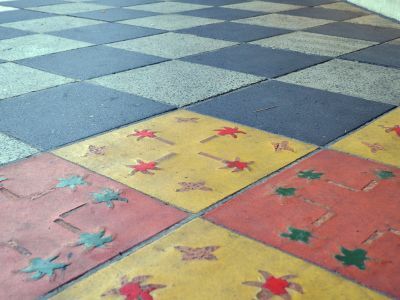 Over 13,600 bespoke modular pavers were fabricated in Ferntree Gully. 1,104m of tram tracks were installed with ‘rubber boots’ to minimise operational noise from trams. Specially designed shelters were made in Geelong. 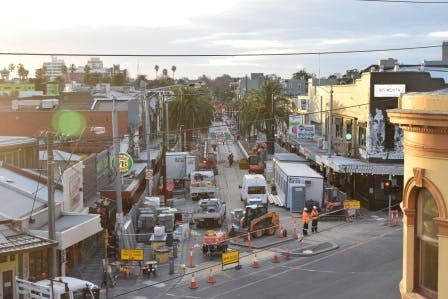 Council’s approach to supporting Acland Street businesses during construction, including free car parking in Shakespeare Grove, reduced footpath trading fees, and marketing and promotion of the precinct can be viewed in Works Update – Managing the Construction Impacts. Who should I contact to find out more about the streetscape upgrade to Acland Street? Please email aclandstreet@portphillip.vic.gov.au or call ASSIST on (03) 9209 6777 and ask for the Acland Street Upgrade team. Who should I contact to find out more about the Route 96 project? For more information about the Route 96 project, visit the Public Transport Victoria website, email ptvprojects@ptv.vic.gov.au or call PTV on 1800 800 007 (6am to midnight daily).